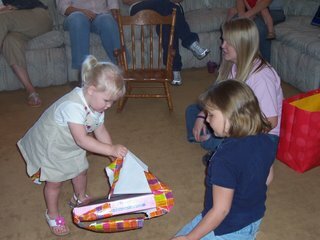 Here are Brooke's 2nd Birthday Pictures...enjoy!!!! Here are pictures of Brooke's 2nd Birthday party!!!! 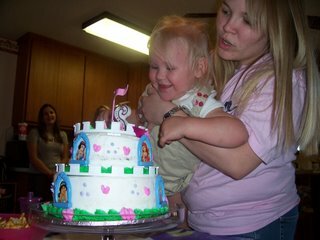 Here we are blowing out the candles....isn't that cake really cool? 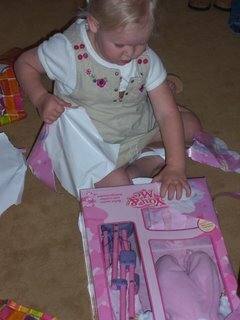 This is the princess dress up kit that she got from Tara & Delaney...we LOVE you guys!!! Here she is opening her gift from Tara & Delaney!!! This song is very powerful in a circusy kind of way. We all need to put away what we do for ourselves and do for the One that is worthy, God. He is worthy of all selflessness, and He deserves it. To hear this song check them out on myspace They are amazing and I love this song, it's very catchy. Check them out. So, its Easter and I haven't posted in a well...shall we say...ummm...few days....okay you got me longer than that. I appologize, but the newness of the computer maybe wearing off so it's really not that appealing to me...or could it be that we got rid of the dialup and so therefore this whole AT&T stuff is much faster? It could be. Before we ditched dialup and said hello to the advanced technology I didn't post from home. No ladies and Gentlemen it took 10-15 minutes for it to do its thing in order for my post to appear on the blogsite. How irritating. And school has been really hectic and crazy although SCH I have not been looking for anyone to write my speeches or anything else for me. I just do it in a couple of hours the day it is due and call it good. I usually make good grades that way. Interesting...nah...scary...SURE. I Easter egg hunted with my daughter this morning and now I know why I live and why family is so important to me. The fun she had and the joy in her laughter made her tantrums all the more better than they were before. She's so little and innocent and its so exciting. She doesn't understand much about the Easter Bunny, but that he brought her some cool stuff this morning and she enjoyed every bit of it. Now we are patiently waiting for my sister and her family to come over and she will hunt some more eggs with them. We have to make it fair for all parties involved. And like SCH (you should go visit his blog to understand more about the Easter post I am refering to) my daughter wore her bunny ears for a short period of time, however, she did not ditch them due to peer pressure, just because she's two and they got in her way. I will post pictures sometime soon of our Easter Adventures in Tuckerland. I hope that everyone has a HOPPY EASTER and remembers why we celebrate this day each year.